The Rhode Island Coastal Resources Management Council (CRMC) has obtained additional federal consistency oversight regarding offshore wind development projects in the federal waters off its coast, as well as that of Massachusetts. The CRMC has been granted this jurisdiction expansion by the National Oceanic and Atmospheric Administration (NOAA) through a new Geographic Location Description (GLD 2018) and changes to the CRMC’s federal consistency list. In light of the influx of wind energy development in the region – there are currently four projects proposed for federal waters off of Rhode Island and Massachusetts – the CRMC requested in September 2018 that NOAA expands the GLD boundaries established as part of the CRMC’s Ocean Special Area Management Plan (Ocean SAMP). The SAMP created a regulatory framework for managing future uses of offshore waters, specifically offshore wind development, and has been touted as an internationally and nationally-recognized model for marine spatial planning. Unlike the GLD boundary established in 2011, the newly approved GLD 2018 is separate and the CRMC is authorised to review federal licenses or permits issued by the Department of the Interior’s Bureau for Ocean Energy Management (BOEM) for wind energy facilities, regardless of size, and associated cables for consistency with the State’s enforceable policies of the Ocean Special Area Management Plan. BOEM has issued outer continental shelf leases for renewable energy projects within the Massachusetts wind energy area (WEA), which abuts the Rhode Island GLD 2011. Within the Massachusetts WEA there are significant Rhode Island commercial fishing interests operating, and the potential for impacts to Rhode Island coastal uses and resources. Under CRMC federal consistency review, if any listed federal activity, either a direct federal agency action or a federal license or permit, is to occur outside the coastal zone (outside of the state’s waters or inland coastal zone boundary), but within a GLD then the federal activity is automatically subject to the federal consistency requirement and the enforceable policies of the RICRMP. Federal consistency is the authority on which the CRMC relies to apply the Ocean SAMP’s enforceable policies to the wind development projects proposed in federal waters. 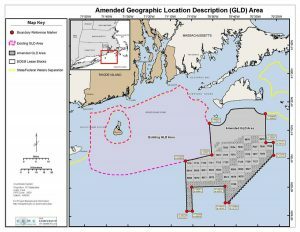 The GLD 2018 includes a portion of the Massachusetts WEA, BOEM lease blocks OCS-A 0500 and 0501, and an area of federal waters south of Martha’s Vineyard and immediately north of the lease blocks where Rhode Island-based commercial fisheries operate.